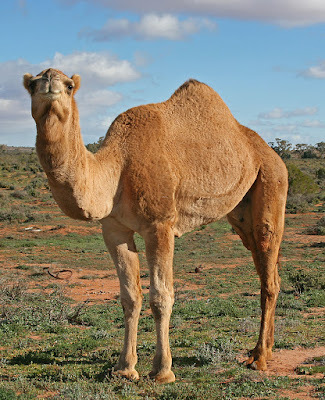 Dromedary camel Camelus dromedarius, copyright Jjron. The Camelidae are a group of long-necked herbivorous mammals with living species native to Africa, Asia and South America. Members of this group have a three-chambered ruminating stomach. Characters (from Animal Diversity Web): Large, ranging in weight from 35 to 650 kg. Head small; neck long, gracile; legs long, slender. Upper lip deeply cleft. Fore legs plantigrade; toes splayed. Skull with rostrum elongate; sagittal crest well developed; postorbital bar complete. Adult dental formula 1/3, 1/1, 2-3/1-2, 3/3; juveniles with three pairs of upper incisors but adults with only one canine-like pair; lower incisors spatulate, projecting forward; canines medium-sized, hooked; cheek teeth selenodont. Wide diastema separating incisors and cheek teeth. Legs with ulna and fibula much reduced, present mainly as splint on radius or tibia. Third and fourth metapodials fusing to form cannon bone proximally only, splaying apart distally. First two phalanges of each digit flattened and expanded; last reduced, bearing a nail. Middle (second) phalanges imbedded in broad pad making up sole of foot. [F84] Franklin, W. L. 1984. Camels and llamas. In: Macdonald, D. (ed.) All the World’s Animals: Hoofed Mammals pp. 72–75. Torstar Books: New York. [G78] Gentry, A. W. 1978. Tragulidae and Camelidae. In: Maglio, V. J., & H. B. S. Cooke (eds) Evolution of African Mammals pp. 536–539. Harvard University Press: Cambridge (Massachusetts). [M66] McKenna, M. C. 1966. Synopsis of Whitneyan and Arikareean camelid phylogeny. American Museum Novitates 2253: 1–11.